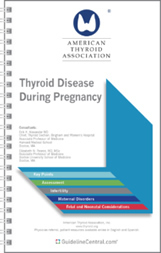 Official American Thyroid Association Practice GUIDELINES Pocketcards quick reference-tools provide your physicians, fellows, nurses, and students with instant access to current ATA guidelines information in a clear concise format. The digital versions of the GUIDELINES Pocket cards are now available on iPhone, iPad and Android devices. Learn more about the mobile app.